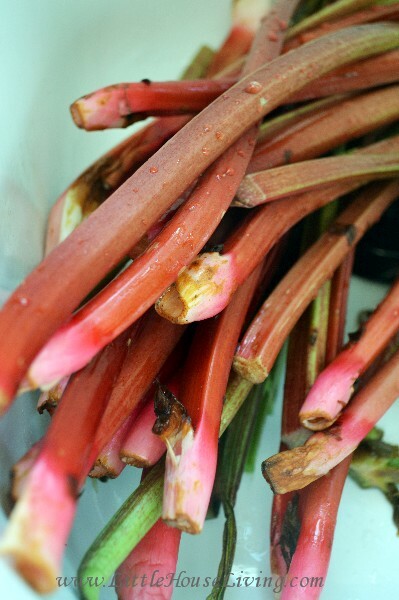 Have an abundance of rhubarb? Fresh or frozen? 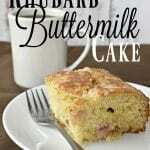 Your family is going to love this Rhubarb Buttermilk Cake recipe! Springtime and early summer is when the rhubarb leaves begin to grow and unfold and all of the delicious rhubarb appears. It’s a little funny that we usually serve this vegetable as a fruit but nonetheless, it’s SO good and usually in abundance. I love making things with rhubarb! It’s wonderful to use fresh but also works just as well frozen or canned. (Here’s how to Can Rhubarb.) If you are looking for several recipes to use your rhubarb in, jump over to my post full of Easy Rhubarb Recipes for Spring. 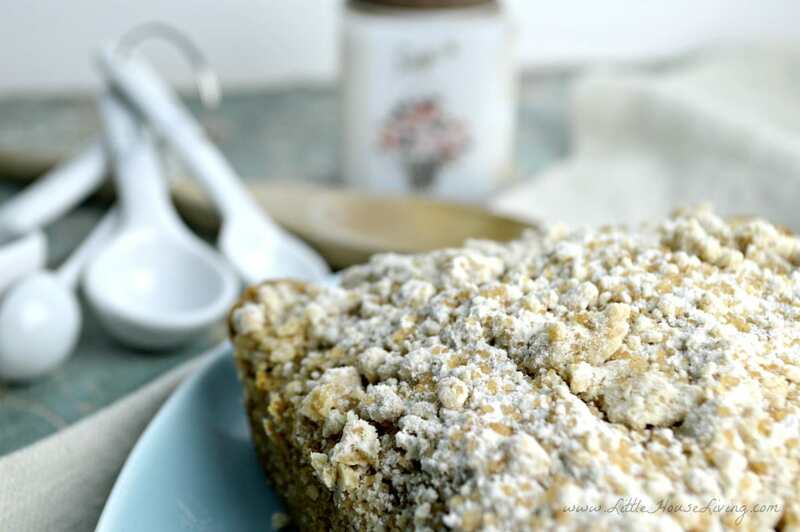 This cake is a yummy play on a coffee cake. The recipe will fit in a 9×13 pan which is quite a bit unless you are serving a crowd so you can always cut the recipe in half and bake in an 8×8 baking dish instead. In a large bowl, cream the sugar, eggs, butter, and salt together. Slowly add in the buttermilk and mix until it’s well incorporated. If you don’t have buttermilk from the store, you can learn to How to Make Buttermilk here. Add in the baking soda, baking powder, and flour. Mix until there are no lumps of batter remaining. Fold in the pieces of rhubarb last. You can use fresh or frozen. 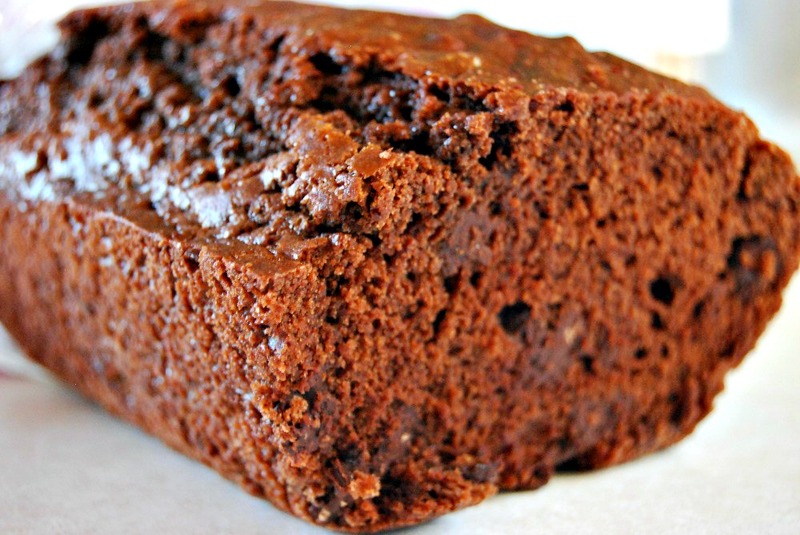 You may need to bake slightly longer if you use frozen because of the moisture content. Pour the batter into a greased, or tin foil lined 9×13 baking pan. If you’d like, combine 1/2 cup of sugar with 2 tablespoons of melted butter and crumble over the top of the cake before baking. If you want to lessen the amount of sugar used, skip this step. Bake the cake at 350 degrees for about 45 minutes or until a toothpick comes out clean and the center is no longer wiggly. Let it cool slightly to cut but serve warm. Combine on the stovetop and simmer together for 2 minutes while constantly stirring. Serve as a warm sauce over warm pieces of the Rhubarb Buttermilk Cake. 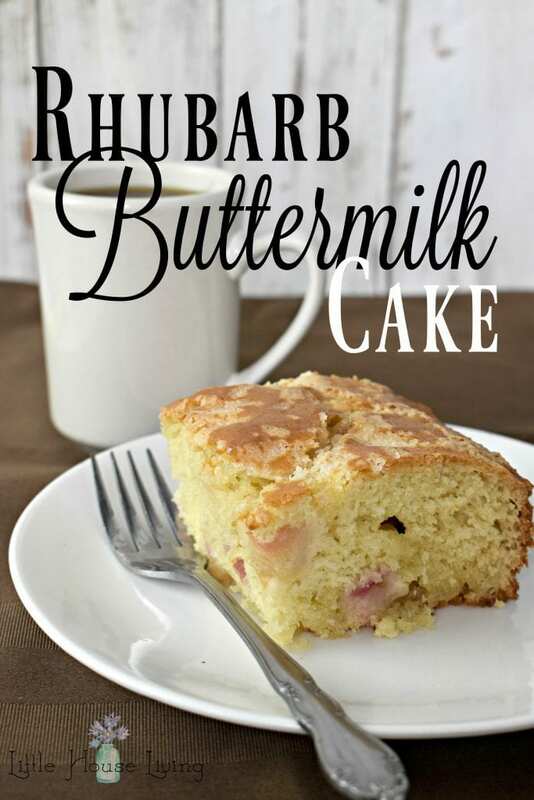 If you’ve been looking for another great way to use up your fresh rhubarb this spring, I hope you will give this recipe for Rhubarb Buttermilk Cake a try! 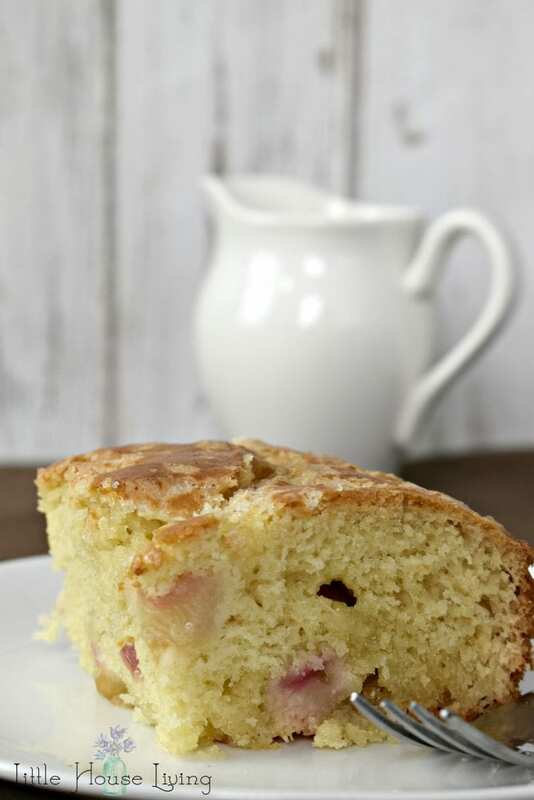 Print the Rhubarb Buttermilk Cake Recipe below! This delicious Rhubarb Cake is the perfect way to showcase rhubarb in all of its summer glory. Your friends and family will love this! Slowly add in the buttermilk and mix until it's well incorporated. Pour the batter into a greased, or tin foil lined 9x13 baking pan. If you'd like, combine 1/2 cup of sugar with 2 tablespoons of melted butter and crumble over the top of the cake before baking. If you want to lessen the amount of sugar used, skip this step. Can you make your recipes so they are print ready? As soon as my rhubarb is ready, I am so making this cake! Do you think the recipe can be successfully halved and put in an 8×8″ pan? Ooops, I just read further, and saw that the cake can be halved. Never mind, lol! This sounds like such a good old fashioned recipe. We had rhubarb in the back yard when I was growing up on the farm. 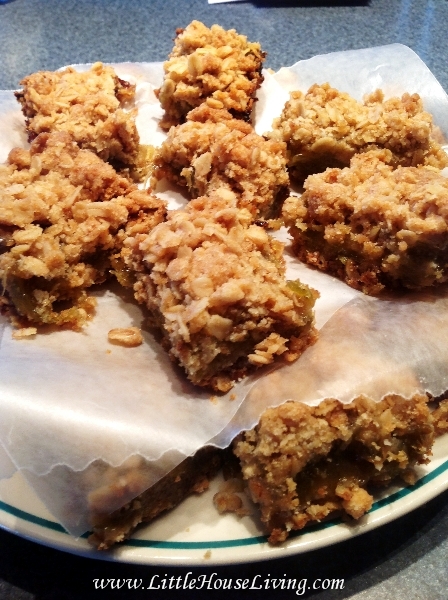 The only thing that we ever made with it was rhubarb cobbler. We also had a lot of buttermilk while I was growing up so this recipe is bringing back some childhood memories. Thank you for sharing at Tasty Tuesdays link party. The cake sounds moist with buttermilk and when rhubarb make an appearance ( I am from Midwest) top of my list and I am thinking the addition of strawberries would make a nice pairing. 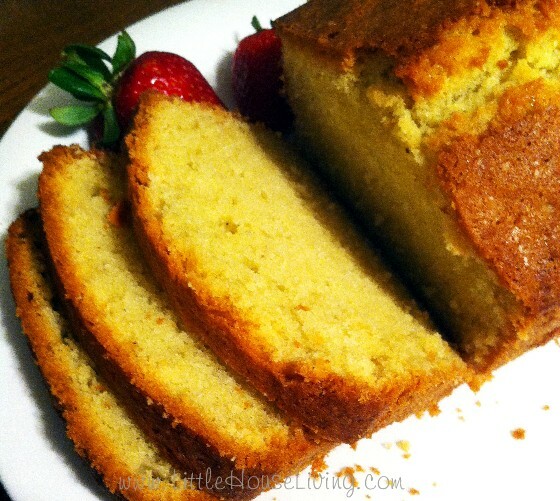 Your Rhubarb Buttermilk Cake looks delicious! So glad you could join us on Full Plate Thursday and thanks so much for sharing with us. Hope you have a great week and a very Happy Mothers Day! What a great recipe! I love baking with buttermilk! Looking forward to trying this yummy recipe! Thanks for sharing at Celebrate It! I loved the recipe, it’s a bit different. I really want to make it look delicious.